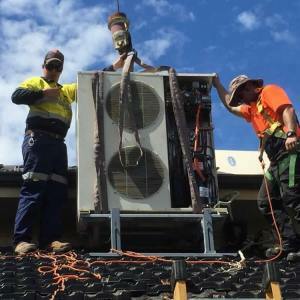 Just like a car, air conditioning units need regular servicing by a licensed refrigeration mechanic to ensure peak operational efficiency. Whether it is a refrigerated or evaporative system, you should consider having your air conditioning units serviced at least once a year. Doing so can save you money on repairs or replacement in the long run. Most modern air conditioning units are built not only to adjust internal temperature to a comfortable level but also to filter out smoke particles, mites, bacteria and unwanted odours. As your air conditioner runs, it accumulates dust and dirt particularly in its air filter. Dirty air filters reduce the efficiency of the cooling unit and can even adversely affect the health of people within the premises. Make sure that the air filters are cleaned properly or services at least annually. The pads are an important part of an evaporative air conditioning units as it soaks up water and acts as the main cooling element in the cooling system. They generally last a few years, with cellulose pads lasting up to five years. Not cleaning or replacing the pads can cause a lot of issues, of which black mould would be the most dangerous one. Replacing the pads are relatively easy but if you are concerned about mould and gunk buildup, consider booking a technician to have a look at your unit and have it professionally serviced. The indoor and outdoor coils of your air conditioning system directly affect the air flow, drainage and life span of your cooling system. These areas need to be cleaned thoroughly but should only be touched by a trained and licensed refrigeration technician. The coils need to be sprayed with a special coil cleaner that makes it easy to clean and also partially lubricates the coils. Commonly present in refrigerated reverse-cycle air conditioners, these parts accumulate a lot of dirt and moisture that become quite gooey over time. It is important to clean these parts and, in some models,, may need to be disassembled in order to be cleaned. It is a good idea to hire a licensed refrigeration mechanic to deal with these parts because mishandling them can lead to unexpected issues with your cooling unit. Having a bit of moisture or water coming out of your air conditioning system is not a problem to be worried about in itself. However, large amounts of moisture and trickling water especially inside the house or building is a serious problem. Over time, excess moisture and leaks can not only affect your air conditioning unit but also home or building structures that are vulnerable to deterioration because of excess water. Refrigerant leaks or a busted water pipe should be dealt with by a refrigeration mechanic with extensive experience in servicing cooling units. Leave this task to the professionals and get some peace of mind that they will do the appropriate repairs for your unit. Unlikely as it sounds, thermostats and remotes that control the air conditioning unit can and do break down after years of use. In most cases, the control unit will need to be replaced with a new one that is compatible with your current cooling system. To ensure that it will work seamlessly with your air conditioner, ask the help of a technician to install new thermostats or to pair up a new remote. Once it’s done, you can enjoy complete control over your air conditioning unit and stay indoors comfortably.